KAYSVILLE, UTAH – A new Electron Heat Power Converter, valued at $40,000, was donated to Davis Applied Technology College (DATC) at a ribbon-cutting ceremony held Wednesday, March 22nd. Students in DATC’s Composite Materials Technology program can now complete their projects in a fraction of the time and learn a cutting-edge process that will prepare them for real-world manufacturing jobs. 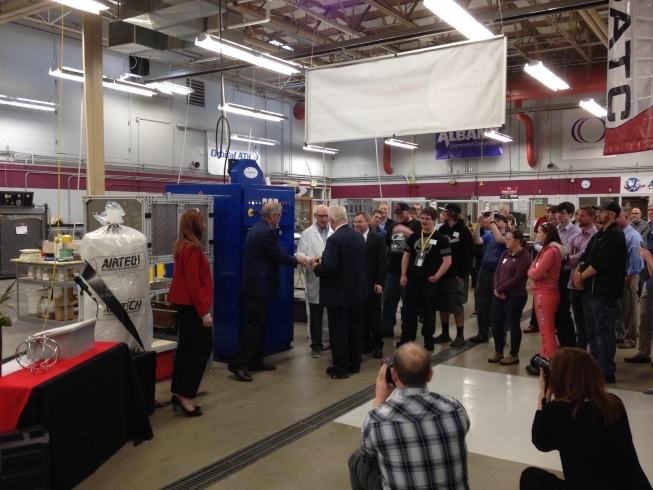 A grant from the Utah Advanced Materials and Manufacturing Initiative (UAMMI) purchased the equipment. UAMMI determined that DATC would give the new technology maximum use and exposure due to the college’s proximity to local manufacturers and strong Composites Materials Technology program. By curing adhesives and composites, the Power Converter, manufactured by Electron Heat, will allow students to cure their projects in 10 minutes, rather than the conventional three-hour curing time, so that students can see their finished projects much faster. DATC instructors have incorporated the new process into their coursework. These curriculum upgrades will teach students current techniques in the composites industry and prepare them for manufacturing jobs using real-world processes. Composites industry representatives from throughout the nation attended the ceremony, including Composites One, Polyone, Jushi, Owens Corning, 3M, Huntsman, Sika Axson, Power Adhesives, Royce and Plexus. Davis Applied Technology College (DATC) is one of eight colleges in the Utah College of Applied Technology system, and is located in Kaysville, Utah. DATC was established in 1978, and has currently provided open enrollment, competency-based training for high school and adult students in Davis and Morgan County. DATC currently offers certificate programs in the Schools of Business, Construction, Health Professions, Information Technology, Manufacturing, Service Professions and Transportation. Our mission is ‘We are a trusted learning community embracing technical education to promote economic growth and student development’. The Utah Advanced Materials and Manufacturing Initiative (UAMMI) brings together public, private, community, industry and education partners to assure growth and sustainability of some of Utah’s most important manufacturing clusters. Advanced materials are essential in Aerospace/Defense, Outdoor Products and Transportation Equipment. Advanced materials include composites such as carbon and glass fibers, ceramics and polymers that are made using advanced manufacturing techniques including 3D printing, filament winding, automated fiber placement, and automated tape laying. Utah has more than 50 years of history in the development and advancement of these materials and has a worldwide reputation as one of the leaders in this industry of the future.